There’s no shortage of tools available to help journalists gather information and produce it for different audiences in compelling ways: stories told through audio, video, timelines, maps, charts, graphs and words. But when it comes to teaching students how to do journalism, it’s not about the tools. “The best practice is practice.” — Deb Wenger, associate professor of journalism at the Meek School of Journalism at the University of Mississippi and co-author of “Advancing the Story"
It’s about getting them to think critically as they do the work of gathering and analyzing information, Katy Culver, assistant professor at the University of Wisconsin-Madison, told more than 100 journalism educators from four countries at last week’s Teachapalooza conference at the Poynter Institute. The best way to do that is to get students out into the field, making decisions in a real-world setting. Teachapalooza is a three-day, hands-on conference that offers educators opportunities to learn about new technologies, share ideas and think together about how to teach the craft. 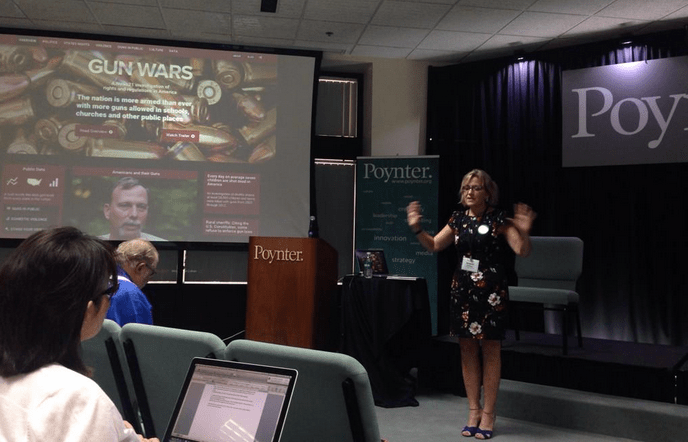 Steve Fox, senior lecturer at the University of Massachusetts at Amherst, talks at the Poynter Institute’s Teachapalooza conference about his students’ work investigating how the campus treats drug cases. Photo by Mark E. Johnson. The educators explored a range of student work, from full-scale projects such as Arizona State University Cronkite School of Journalism’s “Hooked” to breaking news like that uncovered by University of Massachusetts at Amherst student reporters, who found the school was using students as confidential informants in drug cases. Students learn more — and on a deeper and more complex level — through courses and assignments that involve service and experiential opportunities, said Eric Newton, of the Knight Foundation and now innovation chief at Arizona State University’s Cronkite School of Journalism. Establish connections and partnerships with local media to raise the level and profile of student work. Shrinking newsrooms need content, and student journalists can offer resources and people-power to provide coverage — especially video and audio stories — that news organizations just can’t manage in the current environment. Partnerships between college journalism programs and local media can help solve those problems while gaining exposure for student work. The Loyola Student News Service at Loyola University in New Orleans launched last fall with 25 advanced reporting students writing regularly as contributors to NOLA.com and the New Orleans Times-Picayune. The students turned over rocks the NOLA.com and newspaper staff couldn’t, reviewing music shows and covering such stories as a local program that gave away a half a million light bulbs, said Lisa Collins, visiting professor at Loyola University. “Not many NOLA.com reporters are going to cover that, but I have a student who will,” Collins said. Richard Brunson’s students at the University of Central Florida become an ad hoc bureau for the Orlando Sentinel’s sports department, covering prep sports at five local high schools to help the paper expand its sports coverage. The best stories are posted to the Sentinel’s prep sports section, said Brunson, associate instructor of journalism at the university. Brunson trained the students, managed the workflow and edited students’ copy, while the Sentinel offered instructional support, posted the content and hired the class’ top performer for an internship. Even engaging local media in evaluating student work can be beneficial. Karen Houppert, an assistant professor of journalism at Morgan State University in Baltimore, asked some local reporters and editors to critique work done by her students on their capstone projects. Jacquee Petchel, Arizona State University professor and Carnegie Knight News 21 executive editor, speaks at Teachapalooza about her students’ work investigating Arizona’s heroin epidemic. Photo by Tracy Hemmingway. 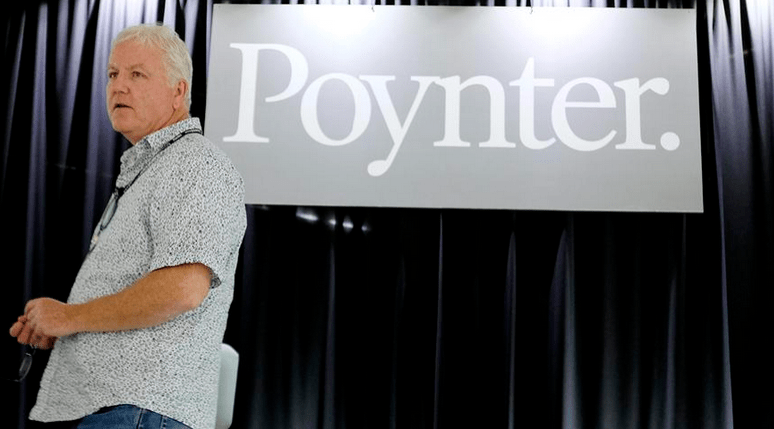 Journalism is important because of its capacity to change the world — and work by student journalists should be a part of that, said Al Tompkins, the Poynter Institute’s senior faculty for broadcasting and online. 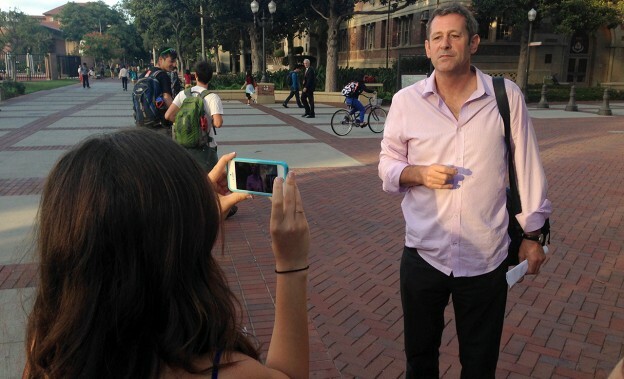 “Whatever they do, they must make the world better,” Tompkins said of journalism students. At Arizona State University’s Cronkite School of Journalism, advanced reporting and broadcast students collaborated on a semester-long project exploring the effects of the epidemic of heroin addiction across the state. Their half-hour documentary aired on PBS stations in Arizona, and their website explored various pieces of the story. “Maybe by doing this, by reporting on this topic, we’ll bring out a better-educated society, and maybe we can solve part of the problem going on here,” Emilie Eaton, an investigative reporter who worked on Hooked, said in a video of students talking about how the experience opened their eyes to the depth of the problem. Taking them out of their comfort zone — and having them tackle an uncomfortable issue — is important, said Jacquee Petchel, Arizona State University professor and Carnegie Knight News 21 executive editor. “Discomfort makes you want to stretch further,” Petchel said. A group of students in Houppert’s capstone reporting class at Morgan State University last year tackled the effects and impacts of Baltimore’s new curfew law — the most restrictive in the nation — and a group the next semester explored how sexual assaults are reported and handled on campus. Both projects caught the attention of local alternative media, which picked up some of the students’ work. Houppert started the fall semester by presenting the idea to students, telling them Baltimore had the potential to be the next Ferguson — months before the city erupted in protest after the death of Freddie Gray in police custody in late April. The students produced a full website of content, including profiles of young people’s curfew stories, vignettes of students at the predominantly black school talking about their own experiences with police and multimedia pieces to complement their stories. Graduate students in different stages of the program at Northwestern University’s Medill School of Journalism collaborated on coverage of the NFL draft, staged in Chicago this spring, said Caryn Ward, assistant professor at Medill. Some were in the second quarter of a four-quarter program, while others were in their third or final quarters, allowing them to learn from each other. The same technique worked for Petchel, who said she paired a quieter student with a more extroverted one — which resulted in stronger work from both of them. Because the pace at which the media industry is changing mirrors that of the technology we use, journalism educators should be revising their syllabi at least once every 18 months, Newton said — any longer than that means you’re falling behind. “Almost anything is better than what you did last year,” Newton said. “The shepherd who doesn’t get fed ends up eating the sheep,” Tompkins said in his Teachapalooza conclusion. Stacy Forster teaches journalism and strategic communication in the School of Journalism and Mass Communication at the University of Wisconsin-Madison. She also serves as moderator for the biweekly #EdShift Twitter chats.